Tim Page, renowned photo journalist continues his 40+ year search to discover what happened to his fellow journalists lost in Cambodia. 181 backers pledged $51,954 to help bring this project to life. With - 24 hours to go, we are looking for 30 people to make a $30 pledge on 3/30! Thanks to everyone who has supported us! The fate of the missing is out there! GREAT NEWS! We've reached our initial goal! Our deepest thanks to everyone who has pledged and spread the word through their network. We still need our Kickstarter partners and we are so grateful to each and every contributor. We've set a new goal, this will allow us to widen the search, tell more stories, enhance the production and improve the film. Please continue to spread the word about LOST BROTHERS! The fate of the missing is out there! "So what? you may ask. All that was a long time ago. It's long since receded from the proverbial rear-view mirror. Ancient history. Water under the bridge. Why bother? Sure . . . you could frame it all up like that . . .
On the other hand, you could frame this story in an entirely different way. What this project, this documentary, and Tim Page’s never ending quest are really about is profound friendship. Brotherhood. In the digital age when you can friend someone with the touch of a button, when people have scores if not hundreds of friends, how many have a friend like this? A friend that cannot, will not give up on a promise he made over 40 years ago. A friend who despite impossible odds would continue to seek the answers to the mystery of your disappearance on a spooky road in a far away land? Yet while Tim continues striving, while we document his perhaps Quixote-esque quest to resolve the fates of his lost brothers - and the additional investigation his original quest has sparked - what we are really documenting is the crazy, unbreakable nature of true friendship. 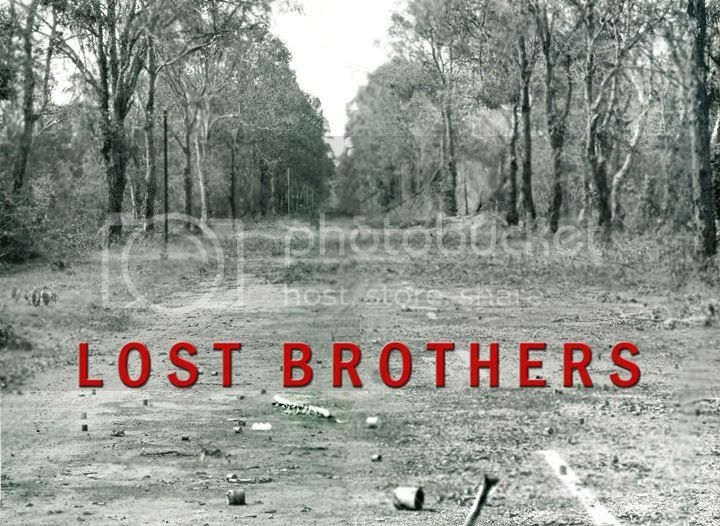 LOST BROTHERS is a documentary about legendary photo journalist Tim Page and his relentless pursuit to find out what happened to his fellow journalists in Cambodia in the early 1970s. 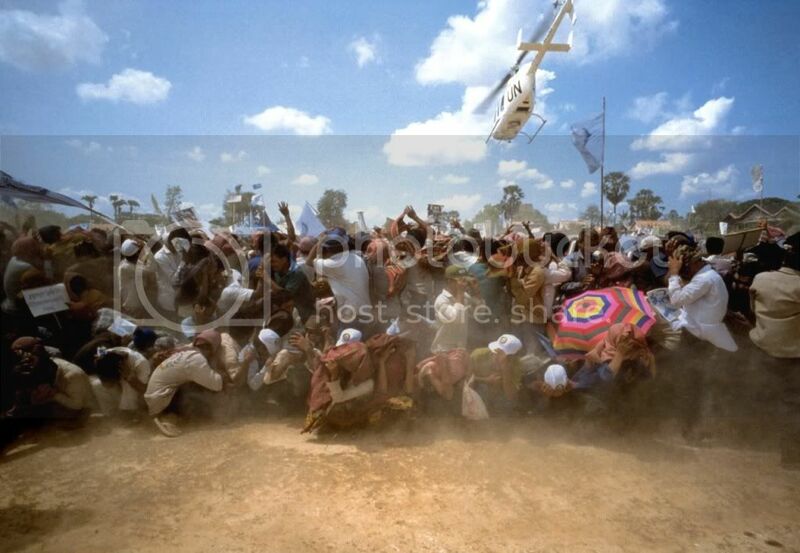 April and May 1970 were particularly devastating months for the media in Cambodia. Journalists covering the war, determined to tell the truth, reporting on the early days of Pol Pot's rise to power, disappeared daily. The last day of May 1970 saw 9 CBS & NBC journalists depart and not return - at that time it was the largest loss in one day for the international media. Tim Page covered the war in Viet Nam from 1965-1969 as a photographer for TIME/LIFE, PARIS MATCH, UPI and AP. Tim and his fellow journalists, friends, roommates... brothers, made a promise to one another, no matter what, no one would be left behind. Tim is determined to keep his promise. In 1989 the borders of Cambodia opened and Tim was able to start his search to discover the fate of his friends. He has returned dozens of times to continue the quest to find out what happened to all of the dead and missing journalists... searching for closure for himself and for the families who never received information about their loved ones. Each trip results in more clues. Your contributions will allow us to document and film Tim's quest, hopefully bring closure, honoring these journalists. 40 years have passed since the journalists disappeared, there is a real sense of urgency to get back to Cambodia in order to hear what the villagers and "one's that know" have to say before the living memory all but dies out. Making a documentary film can be very expensive, production costs, equipment rentals, crew and travel - are at times extreme. These funds will allow us to travel with Tim to Cambodia, and with a small dedicated and determined crew, document his search and uncover the truth. The fate of the missing is out there. If we surpass our initial goal those funds would enable us to continue the search, and would be applied to production and post production costs of the film. We've been very resourceful and flexible... the more we raise, the bigger we can go with this project. This GOAL is a starting point, it will take the power of social media, networking and all of us to get the word out. Every pledge makes a difference, we can't thank you enough for your help and generosity. This project would not have been possible without the help of a lot of people, notably Tim Page, Marianne Harris, the bands Dengue Fever and The Clash, and composer Chris Zabriskie... who generously donated their music... Ian White, Tiffany Hemecker, Francesca Tamme, Nihit, Jim Beaver, Michael Hayes and the IMMF - Indochina Media Memorial Fund, Jim Acheson, Perry Deane Young, and Roger Steffens. This project is only possible with help from you. The more people who participate the greater chance we have of getting this story told. To help please Twitter, share us on Facebook, email a KICKSTARTER link to your friends and family - let them know about this film and campaign. Facebook Fan page "Thank You" for participating. Custom Button: "LOST BUT NOT FORGOTTEN" so you can show your support! Help spread the word, and show your support! Custom memorial rubber wristband LOST BUT NOT FORGOTTEN showing your support with the name of a missing journalist. Special Thanks in End Credits of the finished film plus Wristband, Button and Bumper Sticker. Digital Download of the Documentary when available. PLUS the Production Associate package. Two Tickets to Screening in NY or LA. PLUS the Production Associate package, transportation not included. Photographers: Tim Page, David Dare Parker, Ben Bohane, Stephen Dupont, Jack Picone, Michael Coyne, Ashley Gilbertson and Sean Flynn (Honorary Member & Absent Friend). Hardcover with dust jacket. 132 pages, 64+ Color and Black & White photographs. 12 x 11.5 in. The collection of images in War truly illustrates that war is the disease of humanity. There has never been a time that it didn’t exist. The photographs share a defining message taking us on a haunting journey through the human scars of war to shine a light on the tragedy that occurs when ordinary folk are caught up in situations in which they can affect no change. Four Tickets to Screening in NY or LA. PLUS the Production Associate package, transportation not included + Exclusive eBook of Tim Page photographs. Video chat with Tim Page or director Ralph Hemecker PLUS the Production Associate package. Limited Edition Special for LOST BROTHERS A2 size Poster on Archival Fujiflex of Tim Page's famous photograph Prey Vang Cambodia. Associate Producer Credit on Documentary Film and listing on IMDb (The Internet Movie Database is an online database of information related to movies, television shows, actors, production crew.) PLUS two Tickets to Screening in NY or LA, transportation not included and digital download of the Documentary Film. 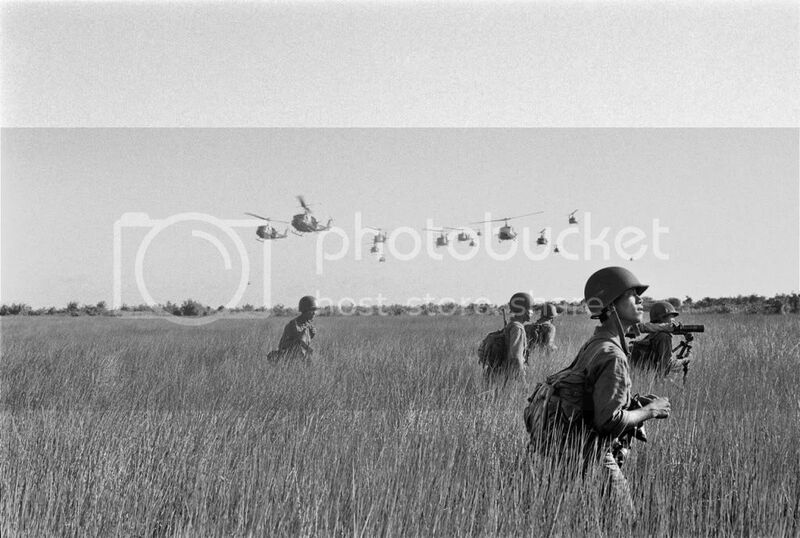 Limited Edition Special for LOST BROTHERS Silver Gelatin limited edition, signed 11x15(approx) photograph ARVN Rangers, depicting choppers over a rice field. Co-Producer Credit on Documentary Film, and listing on IMDb. PLUS four Tickets to Screening in NY or LA, transportation not included and digital download of the Documentary Film. Co-Executive Producer Credit on Documentary Film and listing on IMDb. Private Screening and Lecture in NY or LA, transportation not included and digital download of the Documentary Film.